2. The snow blowers have been replaced by grills and tractors outside of Lowe's. 3. Trees along the street are budding. 4. Crocus and daffodils are blooming. 5. Cindy's Ice Cream officially opened in Elkridge, but they were closed because of the rainy weather both times I went to welcome them back from winter's grasp, or was it a Florida vacation. 6. Allergies are beginning. I am hoping for a better year this year. 7. Earthworms are on the move in the puddles and probably my pool. 8. The temperature has not been below 32 degrees for three days. 9. There is no snow in sight or in the forecast for my city. 10. 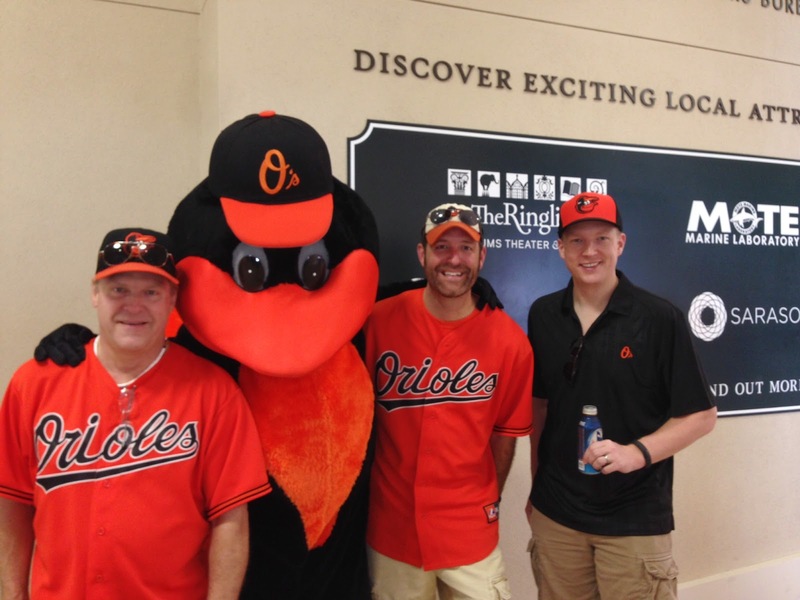 MLB Orioles Home Opening Day has arrived! I know that April has not yet arrived, but certainly that is the only explanation for the almost 2 inches of rain we have received during the past two days. Using the standard conversion factor of 10 inches of snow to 1 inch of rain, I am thankful that we have not received 20 inches of snow. And the rain seems warm. I remember that at one point yesterday I closed my eyes and lifted my face up so that the rain could fall on my face and I could savor its relative warmth as a harbinger of Springtime. I got wet! And I loved it. Rain brings its own problems such as flooding and mud--but it also will encourage my lawn to grow and complete the transition from brown to green! 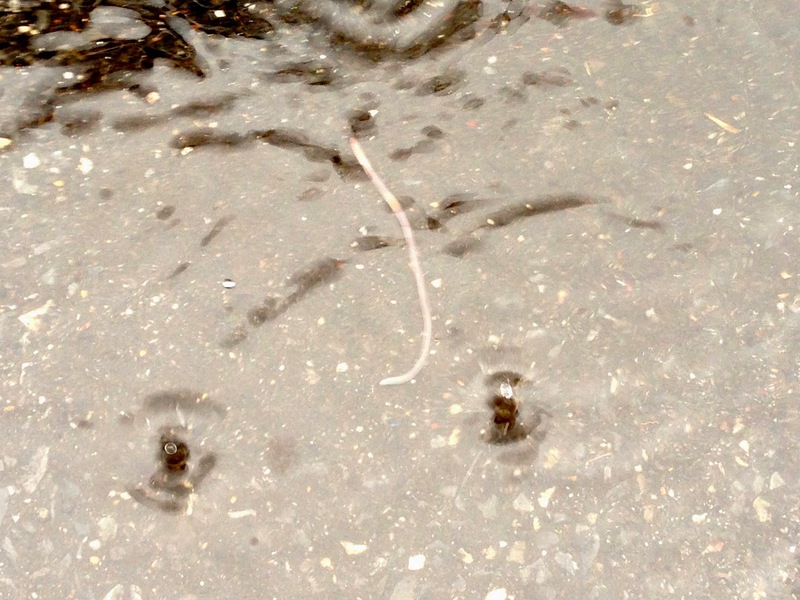 I saw another sure sign of Spring this morning, an earthworm trapped in a puddle of water. I actually took a moment to rescue the earthworm from certain death by drowning and toss it into the yard out of the puddle. Finally, it truly is Spring when Cindy's, the ice cream shop, opens in Elkridge. It had a flag outside yesterday announcing that it was open despite the rain and cold! These are all encouraging signs of the seasonal changes that are afoot. While walking Makayla in the drizzling rain this morning, I spotted a small sight which brought warmth and happiness to fill my overcast disposition. Daffodils are preparing to bloom in my neighbors yard along the driveway--even after the frigid temperatures and the snow of last week--there they were defiantly preparing to usher in the season which has so far been delayed. Even the rain seemed warmer after I spotted the springtime flowers. Perhaps the snowy days are really behind and warmer days are ahead. I am now anxiously anticipating the annual transition of scenery from brown to green and the eruption of blooming plants to add color and diversity and end the season of drab and darkness. I m almost afraid to write this, but feel compelled to announce, nine days after the official calendar designated date, "Spring has Sprung" and is coming to an yard near you, soon! One of the by products of additional daylight in the evening--a combination of daylight savings time and the days growing progressively longer until the summer solstice, is that life's work is never done and there also seems to be more of it. I noticed it yesterday when I hit the streets after a grueling day at work. The evening never ended. There was an oil change for a vehicle, a stop at the grocery store, and a trip to the UPS center to retrieve a package which was just the beginning. The cover on Kitty got blown off by the wind, Cat needed a new registration sticker affixed, there were bills to write out, dinner to prepare--and it was still daylight out. As the light began to fade, so was my energy for the day which began at 5:30 AM on the racquetball court. Long days. More work. Hmmmm! There may be a correlation here. I even thought about getting the tractor out--but the yard was still wet, too wet. At least the sunset is later and later every day. Encouraging people to visit, but not wanting to visit when people are there is a situation that baffles me. 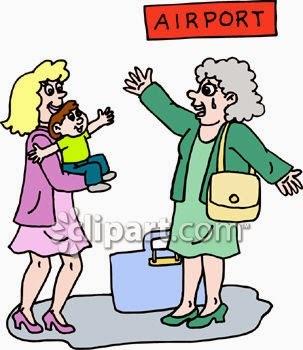 People complain that they want others to go out of their way to drop by to visit, but then remain distracted by electronics or other activities which could be delayed during most of the visit. When others make the effort to visit, they do not want to watch someone reading a book or sitting in a chair in the corner of the room playing a video game. When people arrive to visit, at the request or demand of the ones being visited, conversation and attention should ensue. The attitude of people who complain no one visits them, but then refuse to make themselves available when visitors arrive needs to change. Visitation, like conversation requires at least two people. Last year on March 26th I wrote about the last snow of the season which had arrived on March 25th. This year, it is March 26th and I am again writing about what I hope is the last snow of the season--again. Last year we at least had flowers peaking through the snow. This year we have just cold and snow. But, hopefully it is the last snow. And it was a light snow here--mostly a dusting even though it snowed all day there was no accumulation. I find it coincidental that the last snow of 2013 and hopefully the last snow of 2014 occurred on the same date. As long as it gets warmer, soon. I'm looking for the Spring flowers to start blooming. The T-Ball team that I help coach is supposed to have its first practice on Saturday. The forecast? Rain. Orioles Opening Day is just 5 days away and the forecast is for 60 degrees and sun! By now everyone knows that I spent the weekend in south Florida watching baseball, drinking beer, and eating burgers. I cannot say enough good things doubt my Spring Training experience. What is the most memorable aspect of my trip? Access to the players. Saturday I stood by the bullpen in Port Charlotte talking to the relievers, including Troy Patton, during the game. They are living the dream and sometimes I don't even think they know how much guys like me would trade places with them in an instant. 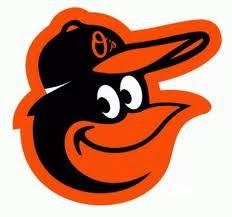 The Orioles looked good. I saw four games and they won two and tied two. The ties were against the other squads "A" teams--which bodes well for the season. My 2014 Orioles season prediction: 96 wins, the division crown and World Series appearance. And the pitching staff will have at least one 20 game winner! 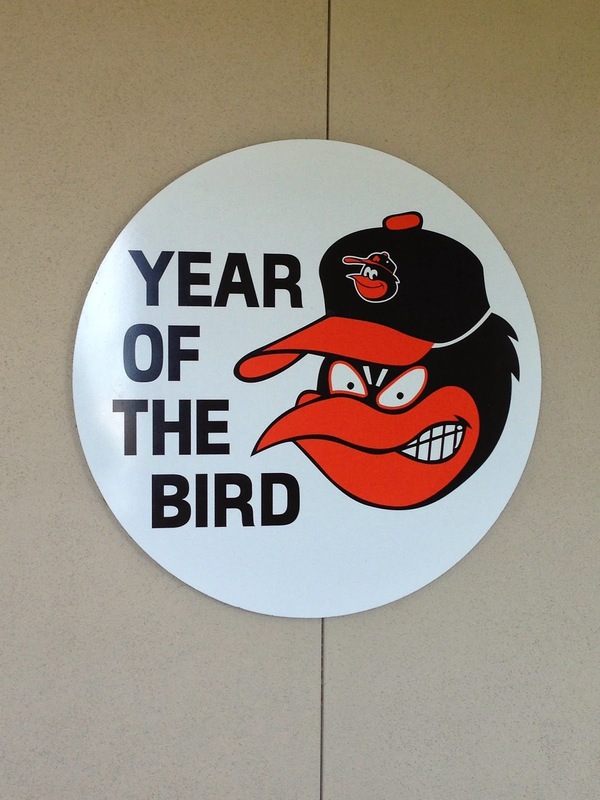 My assessment of the Orioles after my Spring Training weekend. At this point they appear to be a complete team with depth at pitching and hitting with a strong defense. I cannot believe how blessed I was to be able to get to Florida and see my favorite baseball team play baseball, up close and personal. The sun was so warm, I had almost forgotten how good it felt. I got to see my favorite team, up close and personal. Wow! And then I came back to subfreezing cold wearing shorts and flu flops. I must have been a sight at the airport. What is wrong with this picture? Thankfully, it looks as if I won't have to endure shoveling snow with a sunburn today--but it was close. Opening Day is just 6 Days away! 1. Sitting in the breakfast area of the hotel yesterday morning I heard a couple complaining about everything and everyone in the area. I felt sad for them. They just had a very crusty view of life. 2. OK--I got sunburned in Florida. I had to come back looking like I actually spent four days in the sun. In olden times I would have called it a good base for my expected summertime tan, now I feel a bit silly letting myself get burned. 3. Weddings are exciting times and bring families together. They can be a bit chaotic to outsiders. They also are very noisy at hotels. 4. It was a huge shock to leave Tampa's 80 degree temperatures and arrive back in Baltimore's 36 degrees dressed in my shorts and flip flops sporting a sunburn. 5. There was something really great about looking up at the stars in the sky from Sarasota and being warm knowing they were the same stars over Baltimore. 6. I arrived at the Tampa airport yesterday just in time to see the end of the Kentucky-Whiticha State basketball game. Many people were transfixed on the game and as soon as the upset was secured they scurried off to their waiting airplanes. 7. Sadly, the Soviet reunion appears to be continuing despite the best threatening the West can muster. 8. How lucky am I? I just completed a weekend of burgers, beer, and baseball. Four baseball games--the Orioles were undefeated (2-0-2, yes, they allow ties in Spring Training) and the weather was, in a word, idyllic! 9. I am still amazed that I can wake up in Florida, see a baseball game, board an airplane, arrive home and be ready to play racquetball the next morning and then go to work. 10. Opening Day for the Orioles is 7 Days away. The temperature here this morning is 24 degrees. I may have to wear a parka and mukluks to the game if something doesn't change. Day three of the trip was was as spectacular as the first two. I sojourned to Port Charlotte for a game against the Tampa Bay Rays at their Spring Training facility. Although the outcome was a lukewarm tie, 3-3, it was Tampa's A squad against the Orioles B squad. The Orioles looked good and it was another idyllic day in the sunshine with warm temperatures. 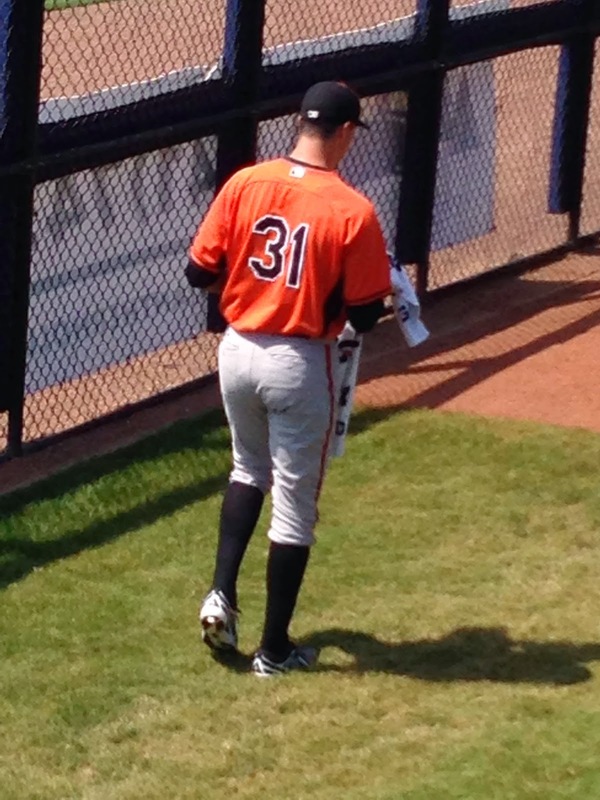 I stood near the Orioles bullpen in the outfield for the entire game and really got a sense of the pitching staff. They are going to be great. I had a lot of fun watching them and talking to them and even got a baseball tossed up to me before the end of the game from one of the pitchers. I watched the starting pitcher Ubaldo Jiminez (31) get ready for his six innings of work as well as the four relievers who followed him for an inning each: Brach, Stinson, Meeks, and Aceves. We traded quips with Troy Patton about his suspension and he made it clear that it will be "game on" when he finally joins the team after his 25 game suspension. The Orioles are going to be awesome this season. The Orioles B team tied the Rays A Team 3-3 yesterday. The best thing about Spring training is that it is all about baseball and the team allegiances are secondary. I have seen fans from almost every MLB Team is represented in the parks and it is all good. Everyone is relaxed and on their best behavior. I have also enjoyed the access to the teams and the players. Today is Day 4 of the trip and, sadly, it will be time to call it a Spring Training and head home at the end of the day. The memories will be more than enough to get me through the 8 days until Opening Day! Looking out the window from the hotel room I see green. And that is awesome. I can also see my favorite "not really a tree" palm trees which just scream sun, warmth, and fun to me. There is a palm at the edge of the image that I decided to take a shot of from the front of the hotel, just because. I went for a nice walk yesterday down the street in the image. It was flat and compelling. I walked along a wetlands area full of wildlife which made the walk very enjoyable. I wanted to stop and take pictures of the birds and wildlife, but was conflicted because I was trying to walk a consistent 15 minute mile. I came up a bit short only walking 15:20 miles, but I did more than two miles of great walking through the green, teeming wetlands. It is March, the temperatures are going to be in the 80 degree range today. There is another baseball game on tap--we are headed to Port Charlotte to see the Orioles and the Rays play a Spring training game ever mindful that Opening Day in only 9 days away--or if I happened to be in Australia it might be today as the MLB 2014 Season officially starts today with the Dodgers and Diamondbacks playing two games "down under." 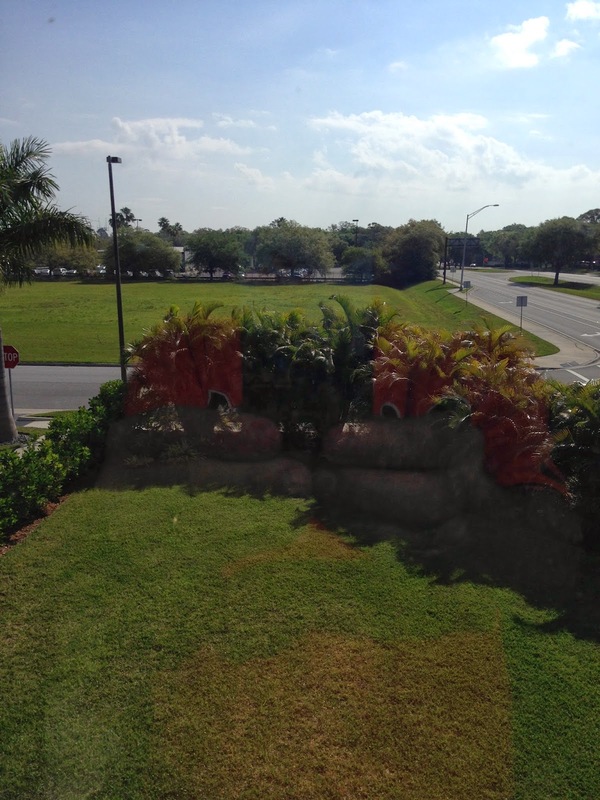 Outside my hotel window, here in Sarasota, there is so much life and so many things to do--I am already itching to hit the pavement and get going on the day. 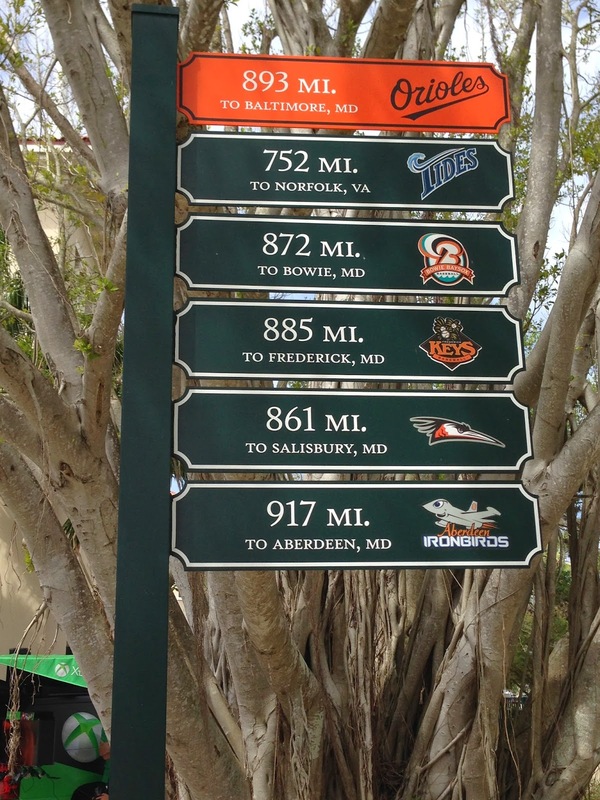 It finally arrived, I am at Spring Training and have already seen the Orioles in a game. It is time for burgers and beer and baseball! I am excited to get out of the cold of Maryland and spend a few days basking in the Florida sun while watching four games in four days--that is the plan. Oh yes, in three different stadiums. Last evening we were in the Pirates Complex in Bradenton. It was a nice stadium and we were part of the largest night game attendance at the complex in their history! Almost 9,000 people. Watching major leaguers play ball up close and personal is the best way to watch a game. After the game, we went down near the field and could almost hear Buck, the Orioles manager, talking to the media. He is actually in the background of the picture of Mike, Jeremy and me. What a day. 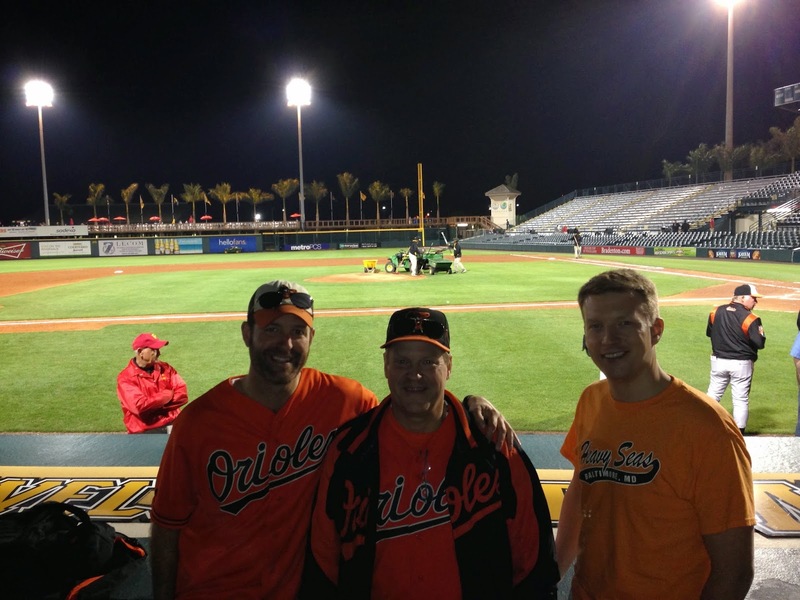 I worked the morning, flew two hours, and attended an Orioles road Spring Training game. Wow! Today the game is at 1PM in Sarasota against the Braves--more fun and given that it is a clear day--fun in the sun! Thank-you to all of my friends, family, co-workers who are filling in while I am off on a jaunt, playing. 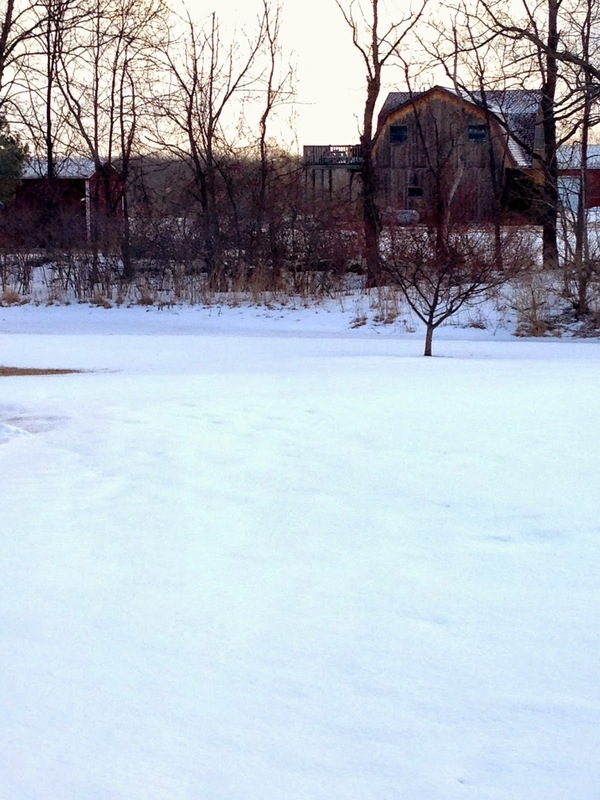 After the snow--my yard is mud. Ugh! It rained most all of the day yesterday, but in addition to the mud there was a secret reward waiting under the snow! My lawn is beginning to revive from its slumber and change to green. Had I not known that just 48 hours before it had been covered with almost 7 inches of snow, I would have thought that April's showers had arrived two weeks early. But, that was not the case--Winter is clinging to the weather patterns with every ounce of its ability. The lawn, however, provides evidence that Winter's grip is weakening despite the snowy forecast for next week! I suppose that I shouldn't rush things too much. But I do feel the need to start the lawn tractor and get the first mowing of the season completed. At this rate, maybe in a couple of weeks. 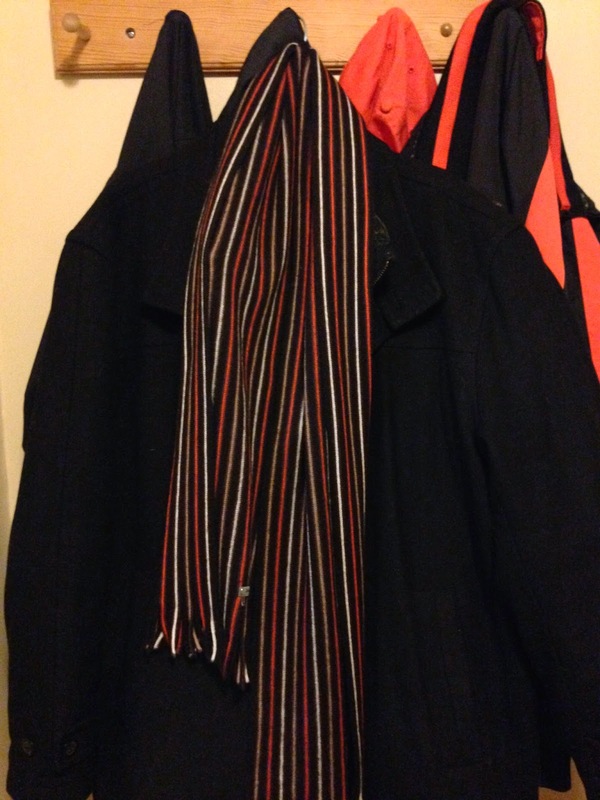 I love my scarf. It has my favorite colors in it and it feels good around my neck on a cold, blustery winter's day. Enough is enough! There have been too many cold and blustery winter days already this year! I have determined that I will not wear my scarf again this season (which ends on Thursday, by the way), nor will I wear it during the Springtime. I'm drawing a line in the quickly melting snow and saying no to more cold! Last Fire of the Season? On Monday I had a roaring fire in the fireplace while 7 inches of snow was falling mercilessly from the gray skies and hopefully, that was the last fire for the cold season as well. I am tired of the cold and I am not going to succumb to it anymore. I received my heating bill for last month and while it was $100 less than the month before, it was still too much! It is time to wrest control of the seasons from Mother Nature and take matters into my own hands! If only that were possible. I long for green grass and trees with leaves and springtime flowers. They are coming! I believe! You Might Be a . . . I decided that I needed to change up the tone of my writing a bit, it has been a bit serious lately, which is not surprising. But, I found something to chuckle about while I was visiting Upstate NY this past weekend. I remember the famous monologue that Jeff Foxworthy does that describes things that would suggest that "you might be a Redneck." I have always found these funny, mostly because some of them hit a bit close to home. Well, I have a new one to add to the list on the website of 300 reasons that you might be a redneck. 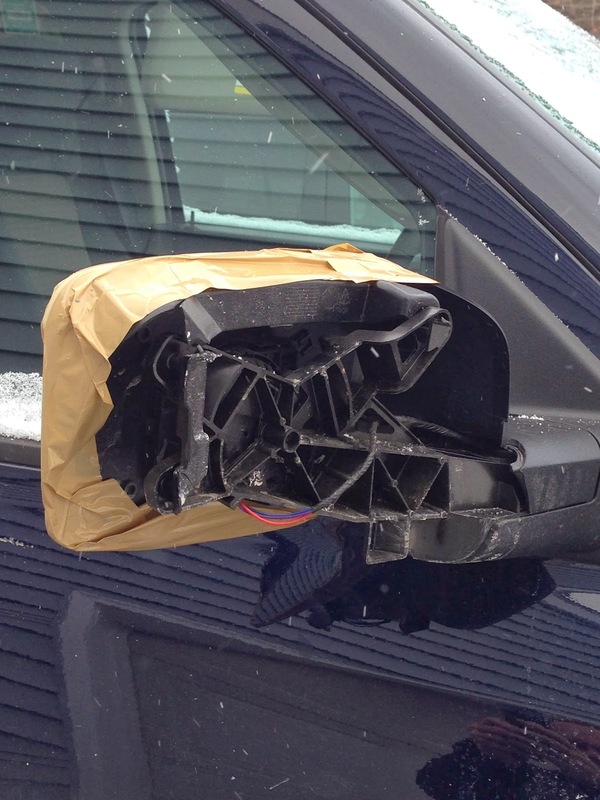 You might be a redneck if your 2012 truck has one mirror held on by packing tape. I found this relatively new road warrior--a beautiful 2012 truck with this one defect--it apparently had some issues going into or out of the garage. Spring begins in two days--and it still feels like winter. I believe the rodent got it right. I looked out this morning and saw that the weather forecasters had not been wrong, as I had hoped. At first I thought that we had about 5 inches, but when I put my ruler into the white, cold stuff; it read 7 inched piled on my deck. Spring begins in four all too far away days. It is St Patrick's Day, I had planned on wearing some really cool socks to work in celebration of the day. The last thing I needed was another day off from work. I am just too busy to leave thinks lying around waiting. I am sure Springtime will arrive soon! 1. Happy St Patricks Day. Wear some green. It is snowing. 2. I am a bit freaked out that a really big airplane can just vanish. 3. How many laws are enforced only occasionally. I wonder if that is why more and more I see people who openly disregard these laws. 4. We have too many laws. 5. Spring begins on Thursday. That's the good news. 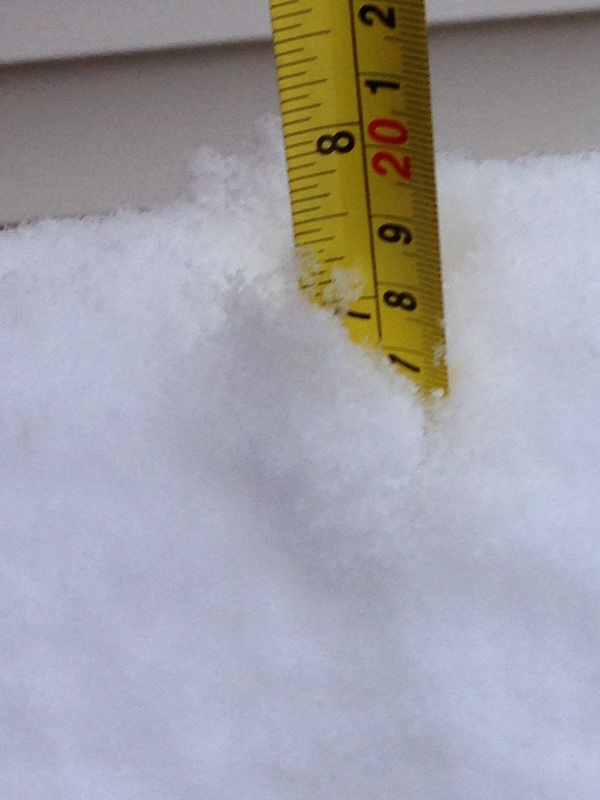 The bad news is the five inches of new snow in my driveway. 6. I've been thinking about this verse from Ecclesiastes 3:4, "A time to weep, and a time to laugh; a time to mourn, and a time to dance." This would seem to say that the process of going through pain and suffering enhances our celebration because we know how bad it can really be. 7. I prayed a mile while walking Makayla yesterday--it was a pretty short walk. 8. What's the difference between common people and brave people? Common people run away from danger, the brave run towards it. 9. The news media seems at its best when the weather is at its worst. I decided to return to Winter for the weekend. Despite the wintery storm approaching Maryland, I determined to drive to upstate New York to experience real winter just to remind myself what it was like. It is cold! There is an incredible amount of snow and the car received a dusting of the unpleasant white stuff overnight. It is depressing. The drive yesterday began under broken skies with scattered rain showers. By Harrisburg the skies were blue and clear. It was a stunning drive except that I longed for the greens of Spring and Summer rather than the grays and browns of the Winter. The weirdest part, however, was that as my journey crossed into New York, the skies became dark and threatening and despite the 40-something degree temperatures I felt sure that I was going to soon be enveloped in a blizzard--which, thankfully, did not happen. The gray skies did compliment the mood of the trip. But, I am happy to report the trip was pleasantly uneventful and that my parents were restored to their home after sojourning for the past two months to warmer climates--well, Houston anyway. Lucky them! I have determined that this winter really needs to end and it appears it is going to remain until well after the calendar says it is over--which, by the way is Thursday when Spring starts which the vernal equinox. I hope Winter takes the hint. It is amazing how life can change with a single phone call. Communication of news--good or bad, can cause a lot of actions and associated reactions. Life changes so quickly. Expectations. Plans. Yesterday was one of those days that are just hard. The news was unexpected and hard to accept. It caused me to dig deep in my faith and to provide support for those who are hurting. Love was demonstrated by my family more than I can imagine. There was nothing easy to say--but there are heroes. One hero that I know has demonstrated nothing but perseverance in the face of overwhelming odds and three years of perpetual bad news. 2:11 When Job’s three friends heard about all this calamity that had happened to him, each of them came from his own country – Eliphaz the Temanite, Bildad the Shuhite, and Zophar the Naamathite. They met together to come to show sympathy for him and to console him. 2:12 But when they gazed intently from a distance but did not recognize him, they began to weep loudly. Each of them tore his robes, and they threw dust into the air over their heads. 2:13 Then they sat down with him on the groundfor seven days and seven nights, yet no one spoke a word to him, for they saw that his pain was very great. I do not know, nor do I pretend to know the answer to the question why. From Job, I have learned that sometimes, the right thing to say is nothing at all, and just being there in silence is the right call. I sometimes wonder what my cats do when I'm not around. The other day I caught them--lounging together in a sunbeam. Louis always seems to sleep on his back, but he looks comfortable. Riordin is more modest and never sprawls on his back. I'm actually very jealous. I wish I could take time out and just lay in a sunbeam. Even for five minutes. It was good to catch them at rest. Literally. I think I'll take a nap when I get home tonight after work and dream of being warm in a sunbeam--especially after the cold day. Warmer weather may be coming, soon! More warmth and more sunbeams to warm me up. After teasing me with near 70 degree temperatures, today is cold, 23 degrees. Ugh. I thought Springtime had arrived, but it seems the rodent in PA was correct. Winter is going to hang on for all of its six more weeks. I had hoped that after I was able to take Cat out for a road excursion that Springtime would be in full swing. 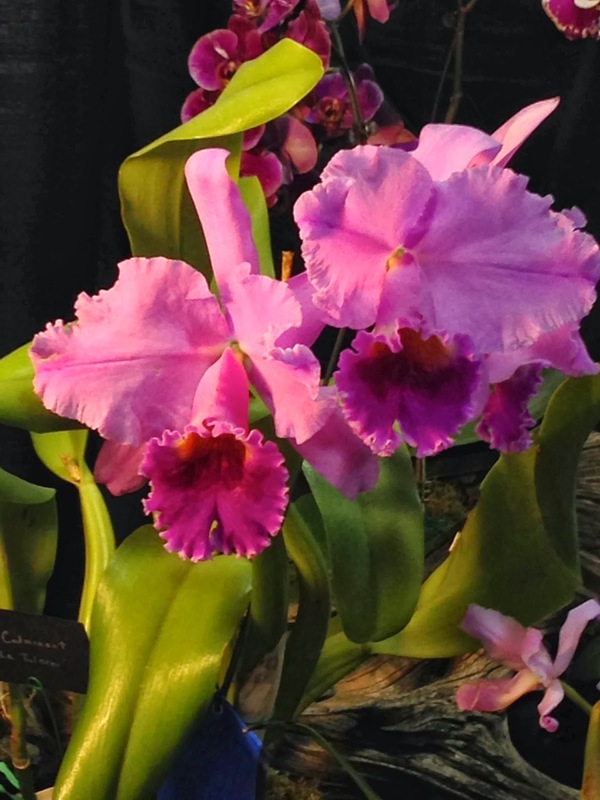 I attended a home and garden show on Sunday where I found this awesome orchid. I was hoping for Springtime and flowers to arrive and begin to transform the barren landscape. My crocus are beginning to push through in the yard--but another round of winter lies ahead, apparently. Despite the cold and the rain and even the threat of snow for next week, I know that Springtime is coming. I am sure of that. Even though I cannot see it, I know it is coming. One of the surest signs of Spring is when Cat comes out of the garage and takes a stroll on the highway. It happened yesterday. I drove Cat to work and was able to drive home with the top down. I wish I could have driven like my hair had been on fire, but the traffic was a bit heavy. The temperatures were in the mid- to high-sixties and although the day was overcast, it was definitely freeing to drive home with the wind in my hair. The day was such a reversal from even last week when the highs were in the 30's and on one morning the low was 4 degrees. 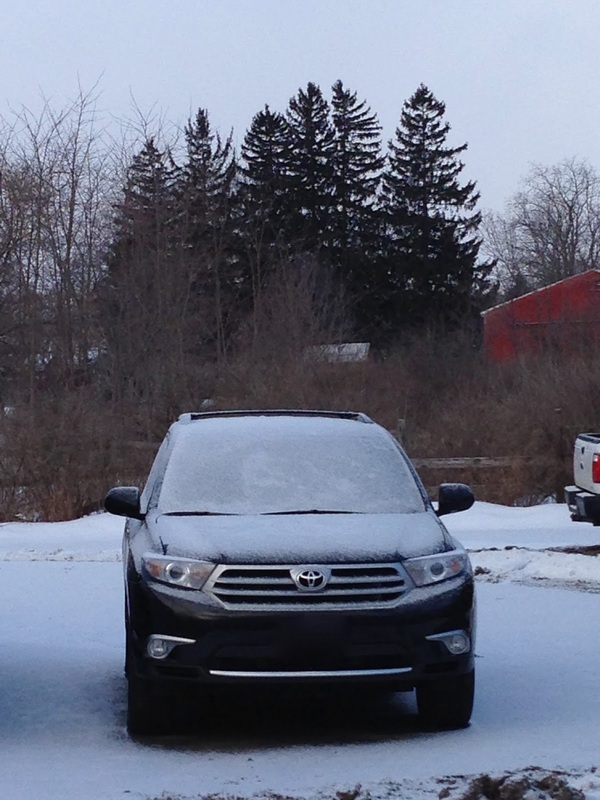 The image on the right shows my two primary vehicles--my winter and bad weather truck is in the back. It has been carrying the load these last five months. But, hopefully, Cat is ready to purr and take over the daily commute duties. Now, if only the weather cooperates. How do I know when Springtime has arrived? I noticed some of them yesterday. 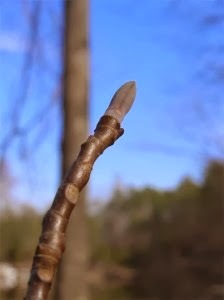 For instance, despite the incredible cold weather the tulip poplars are beginning to bud as are many other trees and shrubs. Flowers are beginning to poke their heads above the ground again to start the growing and flowering process. But one of the sure signs of Springtime is when I willingly head out to the grill to prepare dinner and I don't need to bundle into a heavy coat for protection from the cold. Last evening, that sign arrived. I cooked on the grill and did not have to bundle against the cold. While it was only in the 50's, I can tell that Spring is coming. It has been almost six weeks since the Pennsylvania rodent, who shall remain nameless, forecast six more weeks of Winter. It is time for the seasonal change to begin if his forecast is true. And it has. Today is forecast to reach 68 degrees. Tomorrow is forecast for 70! OK, Thursday's high is set for 32 degrees--but at least the general trend is in the right direction. In my book, that direction is for beach weather! Break out the swimming suits and sunscreen. 1. March has arrived and now in its second week, maybe some signs of Spring will be found, soon. 2. During a birthday celebration last week, I overheard a my daughter tell Jackson, as he was leaning in close to blow out the candles on the birthday cake, not to kiss the candle because the relationship would never work out. 3. It is amazing was a few hours at the groomers will do for Makayla--she looks like a completely different dog. 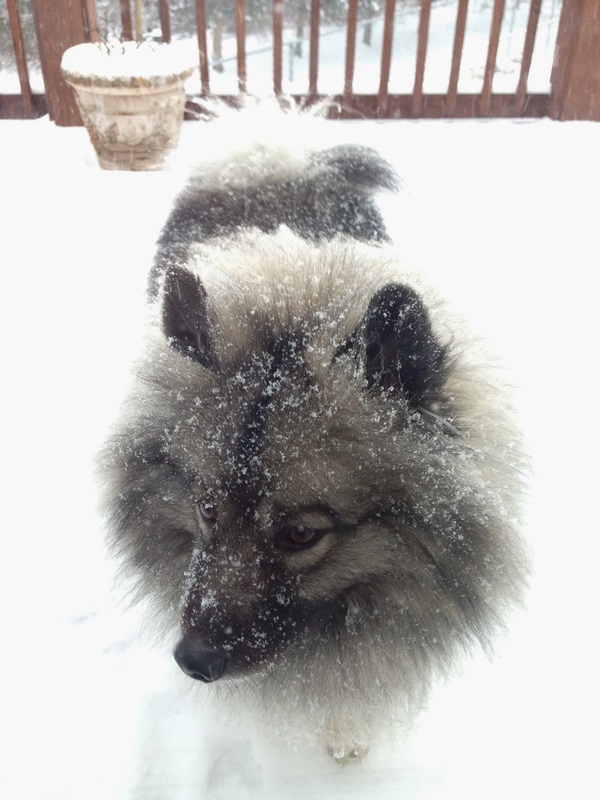 Actually, she looks more like a Norwegian Elkhound than a Keeshond. 4. Why does it seem that although I have access to more TV channels, I am finding less to watch? I am beginning to watch baseball games and hockey matches between teams I don't care about just to find something to watch. 5. I'm looking forward to getting to Sarasota in a few weeks for Spring Training--at least it will be warm there. 6. In an effort to accelerate the arrival of Springtime, we went to the Maryland Home and Garden Show yesterday. It was great to walk among the flowers and displays imagining things that we cannot afford. But, we also found some perfect furnishings as we continue our home makeover. 7. It was really hard to get out of bed on this first Monday after Daylight Savings Time stole and hour from me. It is the time of year when thoughts turn to St Patrick Day, which is next week, and leprechauns. My oldest grandson sets a leprechaun trap every year in an attempt to capture one of the elusive creatures and claim his pot of gold. 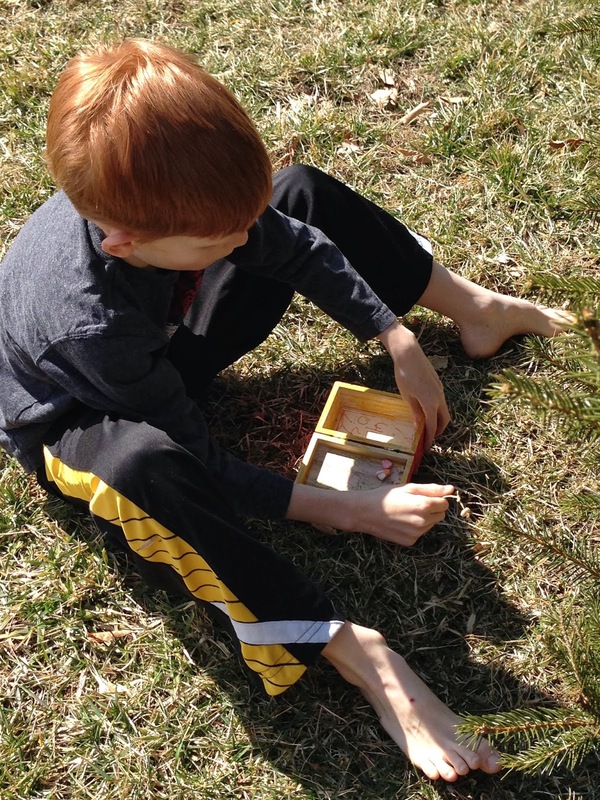 It has become an annual event with Ethan developing a new and more creative trap every year and the leprechaun eluding capture, but leaving behind some treasure for his efforts. It is a classic case of the chaser and the prey--except, much like the Roadrunner and Wile E. Coyote, the prey outwits the chaser every time. The coyote never could capture the roadrunner, either. Ethan is employing a new tactic this year. He is has already set-up the trap, rather than waiting St Patrick's Eve, and is moving locations hoping to both lure and capture the leprechaun while he is reconnoitering the area. The bait? Lucky Charms, of course. Good luck Ethan--I just hope you share some of the pot of gold with me when you finally capture that elusive leprechaun. It is coming, making its annual appearance to deprive nearly everyone in the United States of an hour of sleep. Tonight! 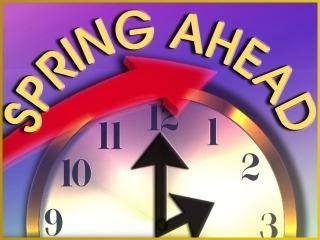 It is the Spring Forward into Daylight Savings time. Tonight, I lose an hour of sleep and it throws me off for about a week. But I do look forward to the arrival of Spring in the form of Daylight Savings Time. Only this year, Spring seems to be staying on holiday. I have a few questions about the time savings: Where does the time go? Can I draw on it later? Does it gain interest? Why do I have to start driving to work in the dark again? Will the green grass return? I look forward to tomorrow when I will look into the faces of the other church goers on the morning after the shorter night before. We will all have that bleary-eyed, self-satisfied look that says, yup, I remembered and I was able to drag my carcass out of bed an hour earlier to make it to church on time. At least this morning the temperature was 28 degrees, 24 degrees warmer than Tuesday morning. That is a positive sign. Maybe Spring will make an appearance soon after I save some daylight. I love the story of the American commander, General Anthony McAuliffe, commander of the 101st Airborne Division surrounded by the Germans at Bastogne, Belgium, during the Battle of the bulge during late 1944 who responded to the German ultimatum for surrender with a single word: "Nuts." I have found another similar response which should be remembered, not for its shortness, but its eloquence. I have been following with great interest the current situation in the Crimea which Russian forces have, without provocation, have decided to occupy. Earlier in the week, the commander of the Russian Black Sea fleet, Adm. Alexander Vitko, visited Ukraine’s South Base, according to the deputy base commander, Capt. Viktor Shmiganovsky. I really think this response says it all. Comrade Admiral--is a direct reference to the days of the oppressive Soviet Union. 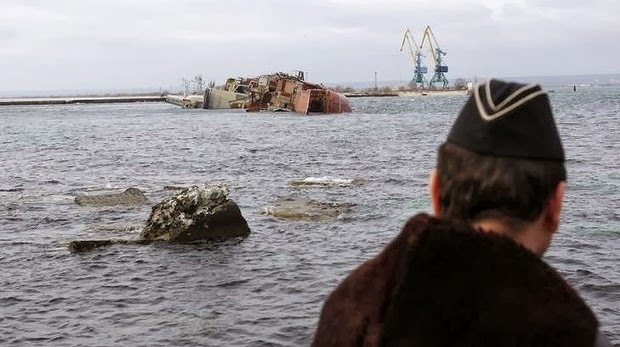 In response, the Russians sank a derelict vessel to trap the Ukrainian navy in its port. But the response was elegant and complete. Wednesday has become Hump Day. 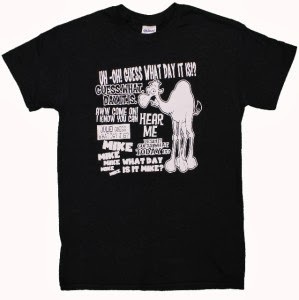 Actually it had been hump day for a long time, but the recent advertisements by a camel in an auto insurance commercial have cemented Wednesday as Hump Day and especially if your name happens to be Mike. 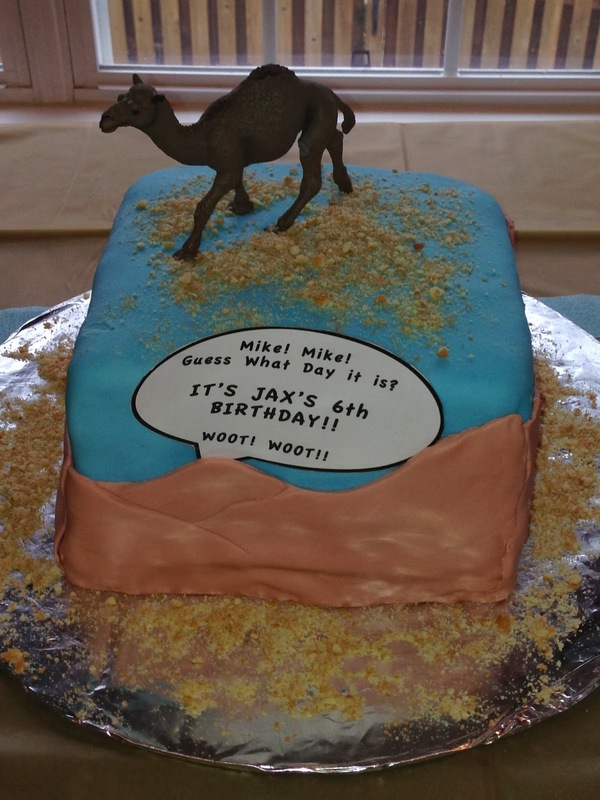 Coincidentally, Jackson's actual birthday fell on Hump Day this year. He was rewarded for this chance happening by having a creative birthday cake designed and baked by his mother. I found this cake to be very creative in its simplicity and beauty. Direct and to the point. It also tasted great--a four layer chocolate cake with vanilla frosting and fondant. Mmm. The birthday boy (and his brother) also wore Hump Day T-shirts to commemorate the day. Sadly, I didn't get a good picture of them in the shirts to remember the day. I need one of these shirts! It was all in good fun and I do appreciate how the image of the camel has been transformed from a cigarette advertisement into a more family oriented symbol ringing in the middle day of the week. Happy Birthday (yesterday) Jackson and to everyone who has a birthday on Wednesday this year, may your year always be on the upswing and not the downslide side of the hump. I read two compelling articles the other day about recreating Woolly Mammoths and other extinct species. One article was titled De-Extintion: Bringing Extinct Species back to Life and was published by the National Geographic. The other was published by the Washington Post and was titled Scientists look to revive the long extinct passenger pigeon. Can man really play god? Can we make right what went wrong? What about less desirable species, like insects or poisonous snakes? Even dinosaurs? I have long been fascinated by the plight of the passenger pigeon. 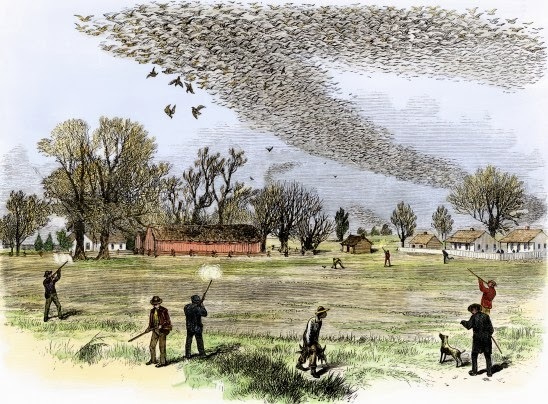 Descriptions of the flocks numbering billions of individual birds and darkening the skies overhead are but memories as the last passenger pigeon died in 1914. And now, scientists believe that they can make right what man destroyed. 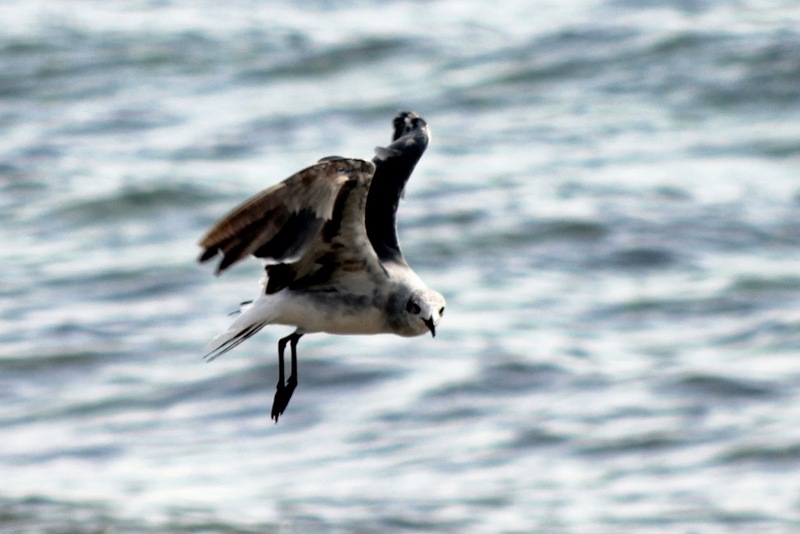 Is it right to recreate extinct species and place them again on the planet which has changed since they departed? It is a question of Jurassic Park implications. What if their reintroduction becomes a significant problem? What if they must be returned to extinction to for financial or other reasons? It is an issue that deserves a lot of thought before investing the millions of dollars to revive a species--even though I would love to see passenger pigeons darken the skies once again or maybe e ben see a woolly mammoth in a zoo somewhere. .
One of my readers has accused me of writing too much about the snow. I stand convicted! I would prefer to write about warm sandy beaches--but there aren't any near me. The snow is ubiquitous and unending, it seems. Untile the snow had finally and completely departed there can be ". . . no joy in Mudville." Yesterday I determined that one member of my family actually loves the snow. Makayla! Although not technically a snow dog, like a huskie, she does have a double coat and she seems to love being out in the snow. The only time she asked to go out and just play and not perform some bodily function is during snow events. Fortunately, the storm under performed yesterday. We were expecting up to 9 inches of fresh, while snow and received only about 5. The bigger problem this morning are the record setting frigid temperatures. The record for the area is 5 degrees and at my house this morning the thermometer reads 5.4 degrees with still an hour to go before dawn. That is too cold for Makayla. Too cold for me. Although, I am headed out in a few minutes to risk life and limb on the racquetball court. Hopefully, this will be my last blog about snow for the season, except to write that it has finally and completely departed and been replaced by green grass and flowers. Time will tell. 1. To misquote a line from a movie: Snow, why did it have to be snow? We are looking for up to 9 inches followed by bone chilling cold. 2. Soviet Reunion, that is what Patrick called the current situation in the Ukraine. Well said. 3. The most valuable commodity before a big storm is? 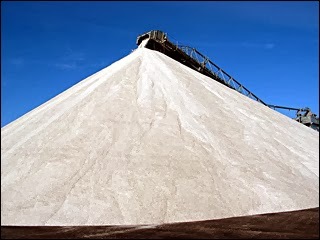 SALT! I went to no less than 8 places looking for it yesterday. I found none--they all were sold out! I need to start looking earlier for the next storm. 4. How do you know a big storm is coming to the Baltimore area? They preempt the news for the weather. 5. When I went to bed last night I was hoping that the forecast for ice and snow was a bad dream. It wasn't. 6. I watched two Orioles baseball games over the weekend. Awesome! 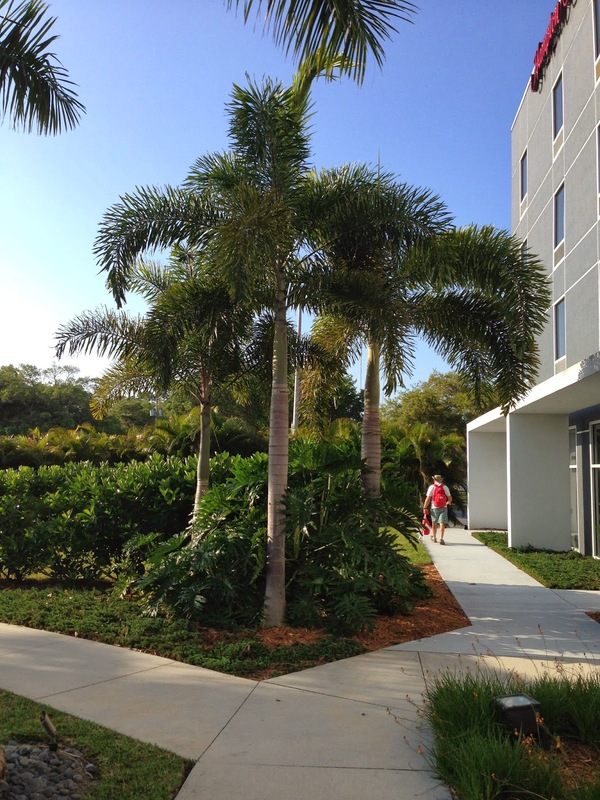 It was sunny and warm in Florida--and I'm not there, why? 7. I watched a lot of the Oscars program last evening. There are a couple of movies that I need to watch. Overall, I was not surprised by the outcomes. 8. Springtime is coming--I am sure. I just can't see it yet. Sometimes the animals in the house do things that are just funny, but perfectly innocent. Such was the case yesterday as Riordin decided that a wine box was sitting on the table needed to be guarded to protect it from the dog and whomever else might be in the house. 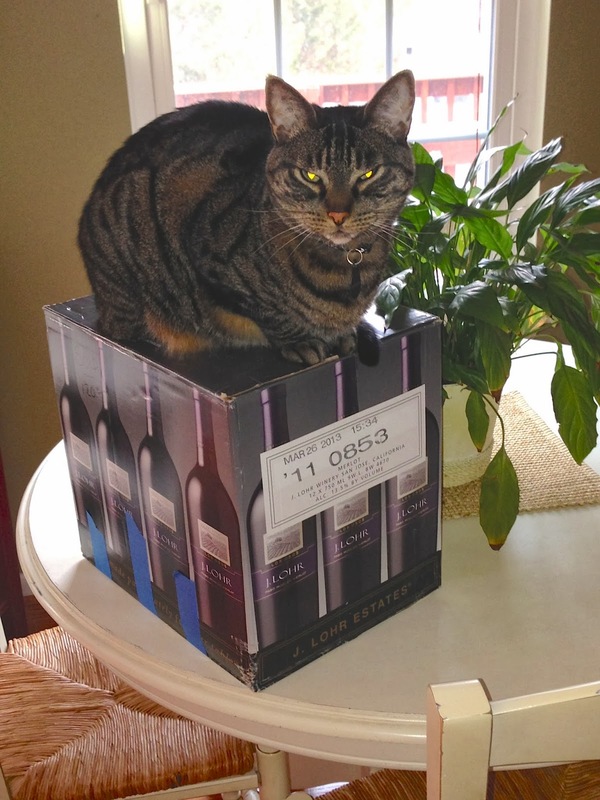 Riordin remained perched on the wine box for quite a while and had no issues as I documented his self-appointed role. I'm just glad he just guards and doesn't drink the wine. That would surely be expensive! 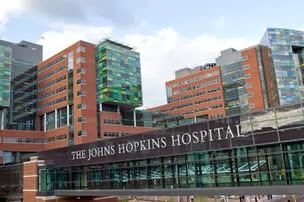 I spent yesterday in the waiting room of the outpatient surgery center of Johns Hopkins Hospital with Chris, who was having a minor procedure. Talk about confusion and bureaucratic inefficiency--that was the story of my day. The day was lost from the very beginning. Both the surgery center and the time of the surgery were change on the day before. The big problem was that they forgot to tell us that the surgery had been slipped from 1030 to 1230. No problem, I can handle that. But as the day wore on, the surgery slipped with each passing hour until finally occurring at 3 PM. Ugh! We did not finally depart until almost 6PM. Fortunately, I had my trusty cell phone for company. Until the battery died. It was the realization that the cell phone would expire before the day ended that caused me to begin watching the people. 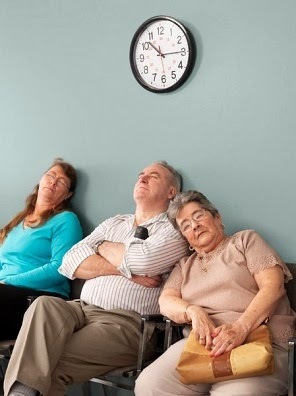 I remember an older couple waiting for the husband to have a procedure. I was amazed that when the man was called, the wife waved good-bye and didn't walk with him to go back for surgery. The wife then opened her purse and began to eat lunch right there in the waiting room. I only mention it because there were a lot of people waiting for procedures and they cannot eat--and so I am sure the food caused some angst among those who were hungry as lunchtime approached. I was also fascinated by other people, some furiously conducting business on their cell phones while plugged into the wall trying not to think about their loved one in the surgery center. A needed distraction from a long day, I am sure. And I overheard a sad story involving a man whose significant but unmarried other was having surgery, but he could not have access to help verify insurance information to get prescriptions. Somehow, the laws enacted to protect privacy have run amok by excluding people who are responsible for health care from access to the information they need, but, it seems the government can get any personal data that it wants. There were so many people, coming and going during the day--until the end. We were almost the last people to leave. They were cleaning up the center around us as we left, more than eight hours after we had arrived. I was happy to pay the $12 parking fee and drive home after the successful surgery.